Controlling a manufacturing process requires accurate monitoring. And for that, your sensor must be close to the product being monitored, especially in food processing where one container is inside another. The ultra-small DataTrace® Micropack III (MPIII) Pressure Data Logger has a body measuring just 1.9 inches long. MPIII Pressure Data Loggers fit inside containers to get pressure readings from 0 PSIA (0 BAR) to 72.5 PSIA (5 BAR) with exceptional accuracy at temperatures up to 140°C (284°F). With their wide range and high precision, MPIII Pressure Data Loggers are not only well suited to canning and pouch processes, but an array of applications where pressure affects products and quality. 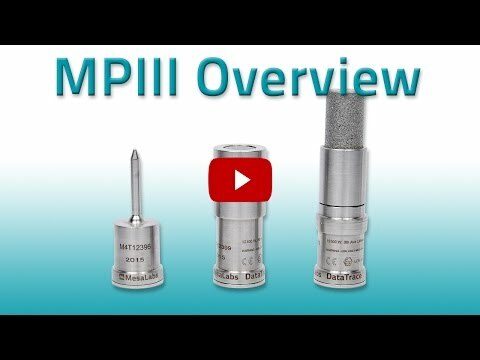 See how all of our MPIII data loggers can help increase data accuracy for almost any process. The MPIII Pressure Data Logger provides highly accurate, NIST traceable data to help you optimize food, pharmaceutical and other manufacturing processes. Since it is capable of storing up to 16,000 data points – 8,000 each for pressure and temperature readings – highly precise measurements can be made over a wide range of your process and validation applications. With unmatched accuracy and precision, the MPIII Pressure Data Logger can meet the majority of your process pressure monitoring needs. Part of DataTrace®‘s comprehensive solution, the wireless Micropack III Pressure Data Logger requires minimal training to use. Features like IR communication and batch programming and reading makes data collection fast and simple. MPIII is a single, integrated solution which can be extended to simplify data logging of an array of process parameters. At the heart of the solution is DataTrace®‘s intuitive and highly secure FDA 21CFR Part 11 compliant DataTrace Pro software. You can’t beat it for flexibility and ease of use. Create reports in any format you want. Save time and money with automatic downloads and graphs. Use password protected access, electronic signatures and automatic documentation for audit trails to streamline your work. Even synchronize multiple Loggers (in any combination of Logger types) to the same program. When the pressure is on, this is the system you need. The Micropack III pressure data logger’s small design and intuitive, easy-to-use software makes it easy to integrate into your process, greatly improving your productivity.